As we explained on our ‘concept’ page, MaXxive Records is not here to provide you with a sum of money to create an album, but to make sure you can lower the costs of creating an album! On this page, we’d like to explain all options and possibilities we have to offer. We have our own studio, where we can record most of your album. Vocals, bass, guitars, synthesizer or piano… it’s not a problem! We can also provide you with a way to record your drums, either real acoustic drums, or digital drums. So basically, we can record the entire band or artist ourselves! We can help you produce your album. Together, we can help you decide what to record, what’s missing and which sounds to use to get the sound you want for the album. So, everything is recorded, you have all the tracks in perfect, high quality wave files. Now what? Mixing! 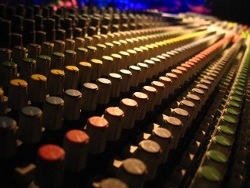 Mixing is basically the stage where the sound of the album is decided. Will it be a natural, acoustic sound or will it be a full metal album with a wall of sound? Recording is one thing, but mixing is another. We can do that for you! After the mixing process is done and the sound is set for the album, the tracks need to be mastered. To make sure there aren’t any weird frequency or volume spikes, that it’s loud enough to be compared with other songs and that the stereo image of the whole track is okay. We can do that too! After the album is fully done and released, we’ll make sure the album is available all over the world, in digital and physical form. We’ll handle the distribution and we do some promotion to get the album known across the globe. We’ll send it to reviewers, to (online) magazines, etc. All to gain promotion for the album! The more promotion, the more exposure! At least, that’s the idea! Besides all this, we can do a lot more for you, but that all depends on what you need, what you’re good at and what you want us to help you with. It all depends on each band and artist individually and we’ll make a plan for each individual artist or band. Do you feel you should be part of the MaXxive Records Family? Contact us through e-mail, facebook or Twitter. And blow us away with your music or your plans! We’re open for all kinds of ideas and certainly all kinds of music!